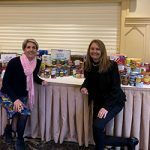 Amy Mitchelll, Principal of Montessori Children’s House in Horsham and Nona Melnick, Montessori Children’s House consultant, delivered a hearty donation of non-perishable items to the Greater Horsham Chamber of Commerce for their “Forever Food Drive”. “The Forever Food Drive” program is an ongoing effort to supply the community food pantry which is run by St. Vincent DePaul Society at St. Catherine of Siena in Horsham. The children and families at Horsham Montessori Children’s House came together and collected a large amount of canned vegetables, cereal, dried pasta, soup and more. The children were excited to be a part of this great event and to have the ability to help, even at such a young age. The teachers at Montessori Children’s House instill the value of kindness each and every day in the classroom and continue to teach the children about helping others and sharing. 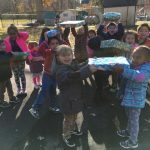 The students and families at Montessori Children’s House in Horsham are collecting new toys for children less fortunate than themselves. The children are learning the act of kindness by donating to Toys for Tots. The mission of U.S. Marince Corps Reserve Toys for Tots Program is to collect new, unwrapped toys during October, November and December each year, and distribute those toys as Christmas gifts to less fortunate children in the community in which the campaign is conducted. The primary goal of Toys for Tots is to deliver, through a new toy at Christmas, a message of hope to less fortunate youngsters that will assist them in becoming responsible, productive, patriotic citizens. We are proud of the hard work done by our students and families! The Blue Bell Montessori Children’s House participated in a holiday adoption program through the Mattie N. Dixon Community Cupboard . The school was matched with 3 families in need (a total of 10 children from 3 months to 10 years in age.) Items such as clothing and toys were collected to help brighten the holidays for children in need in the surrounding community. The children shopped with their parents, and then helped wrap the gifts at school. The children were excited to help pack the gifts up to be delivered to the Community Cupboard. "We could not be more thankful for the love and care you show Ethan every day. We are so fortunate to have found such a wonderful learning environment for our son."